Each piece of land has its own story and unique requirements. Watermark Engineering Resources conducts a thorough review of existing site conditions, zoning requirements and government regulations to enable you to make informed decisions and successfully complete your projects on time and on budget. Watermark’s experienced team gathers and distills critical information to help evaluate the feasibility of your project goals and objectives – and provide expert guidance and innovative solutions to help you achieve your vision. Our designers are experts at guiding our clients through the big picture design process. We know how to ask the right questions, drawing our clients in and helping their visions come to life. We help them define, organize, and prioritize elements of the project from a 30,000-foot view. With this process, client’s goals and objectives become better defined and the master plan we create as a team, serves as the framework for the rest of the design process. In this phase of the design process, we will work with you to explore in greater detail, the best possible design options. We facilitate and draw out your vision through our discussions on project arrangement, user experience, layout, material selections, colors, textures, and forms. With this finalized conceptual design, your vision starts to come into focus. It is critical to determine early on if you can realistically develop a parcel of land to meet your goals. The site plans we produce range from conceptual to final, but all begin by asking the right strategic questions to ensure that our client’s goals are met. These plans are developed and rooted in a deep knowledge of land development design with a trained eye for understanding how lines on a page translate to real world conditions. This plan becomes the foundation for everything from helping our clients understanding their return on investment, to defining the required approval path and timeframes, to constructing the project. We help our clients set a new course and dream about what the future of their community could look like. We help you create a comprehensive 5-year master plan that will outline goals and objectives based on your community’s facilities, needs, and input. We can meet with community groups and committees to hear their voices and translate that data into opportunities. 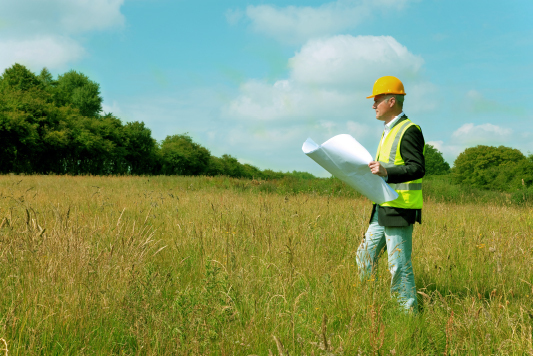 A Site Investigation Report/Due Diligence report provides our clients with a preliminary but thorough look into the advantages and challenges of a potential development site. This report helps expose any skeletons in the closet relative to the development of the project, before our clients spend valuable time and money. This typically involves meeting with municipal staff, a review of the applicable ordinances/codes, a study of any existing plans, surveys, or maps, and site observations by an experienced member of our team. Although the content of each report is unique to the client, the typical information produced includes: building and zoning requirements, utility availability, a review of the natural amenities of the property, floodplain determination, and project approval timelines. Land development is not easy. Watermark has the experience and knowledge to represent our clients in all types of situations including testifying at municipal public meetings. Our team of Professional Engineers, Landscape Architects, and Arborists will represent your project with integrity and expertise; helping you obtain the approvals you need to move forward. Finding your way through a zoning process can be challenging, especially if you haven’t done it before. Our team will work with you to outline the zoning process, set-up and attend meetings, complete applications, prepare exhibits, and attend zoning hearings for your project. We work hard to keep projects on schedule by providing project leadership and communication that you can count on. When a right of way taking occurs, real estate belonging to private land owners will be impacted. Watermark uses our unique insights and perspective from decades of land development experience to identify the impacts, quantify the damages, and give our client a comprehensive plan to ensure they understand their options.